An acai berry is a small purple fruit that can be found throughout Central and South America. 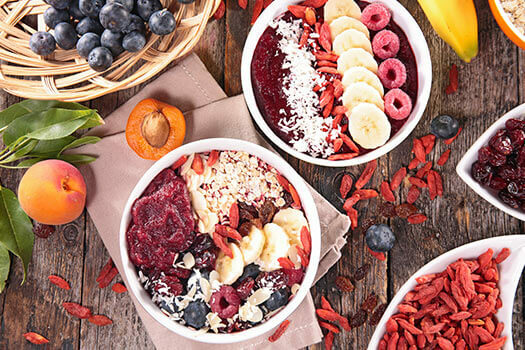 Nutrition and health experts now claim acai berries are a superfood because they are packed with dozens of vitamins, minerals, and antioxidants. These amazing berries can provide seniors with many health benefits, which is why they should consider having a few servings every week. No single fruit or vegetable can kill all cancerous cells, but acai berries contain several vital nutrients that could reduce a senior’s risk of cancer. In addition to vitamin C, these berries also contain a phytochemical that destroys tumorous cells before they can multiply. Also known as antioxidants, these phytochemicals lower the risk of dozens of age-related ailments, including heart disease, type 2 diabetes, and different types of cancer. High cholesterol levels can negatively impact a senior’s health and lead to conditions such as strokes and heart disease. Acai berries are filled with sterols, which can break apart blood clots, relax the blood vessels, and increase circulation. Seniors who are trying to increase their cardiovascular health should add sliced acai berries to their salads, fruit bowls, and smoothies. Much like red wine, acai berries are packed with anthocyanins. These antioxidants are what gives red and purple plants their unique hue, and they also fight the free radicals that damage veins and arteries. A 2016 study published in the journal Nutrition found those who regularly ate vibrant berries had lower cholesterol levels as well as lower rates of cardiovascular disease. One of the reasons age-related blemishes occur is because of a phenomenon known as oxidative stress. This process occurs when the body no longer has the resources to fight off free radicals. While these blemishes might not seem like anything more than cosmetic issues, they can lead to a variety of serious medical conditions. Seniors who don’t take care of their hair, skin, and nails often have to manage issues such as rashes, psoriasis, and nerve damage. Different medications and ailments can negatively impact a senior’s digestive system and result in issues like constipation and diarrhea. Eating as much fiber as possible can reduce discomfort and promote healthy bowel movements. Every 100 grams of acai powder has about 14 grams of fiber, which is nearly half of what the average senior needs each day. Acai powder can add amazing flavor to many dishes, including oatmeal, pudding, yogurt, smoothies, and fruit salads. A nutritious diet goes a long way in promoting a senior’s health and wellbeing. If you’re undecided on what to cook for your loved one or need a break from your caregiving duties, consider hiring a caregiver. Oshkosh respite care professionals can assist seniors with a wide array of daily tasks, offering family caregivers the chance to focus on other personal responsibilities or take a break to prevent burnout. Whether it’s for a few hours a day or a few days a week, respite care is the perfect solution for family caregivers who are feeling overwhelmed. Call Home Care Assistance at (920) 710-2273 and find out how our revolutionary care plans can help your senior loved one age in the comfort of home.